You know him as a superstar who's won awards and appeared in videos and pulls all those great moves onstage. But long before he was a Backstreet Boy, he was my boy--and I want to share his whole exctitng story with you. I'll tell you about my favorite memories of Nick, as both a mom and a manager...what he was like as a little boy, his dreams, the early auditions and contests, the pain and the heartbreak along the way, the big break, and the behind-the-scenes entries that only an insider gets to see. Since I've been in touch with so many of you, I know the kinds of things you really want to know. And just like you, I love him too--so let me share some secrets (and maybe brag just a little...after all, I am his mom). 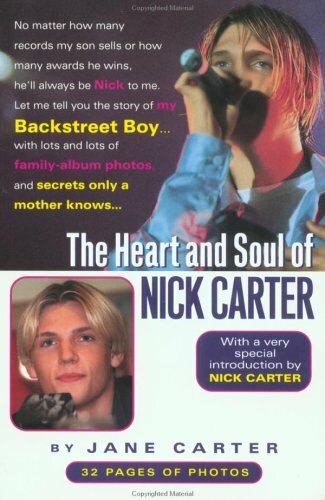 About Nick Carter (Introduction) : Nick Carter is credited in young adult books. Published credits of Nick Carter include Heart and Soul of Nick Carter.